IR-Day was held on April 11, 2019. Summary of Presentation and Q&A Session added. Investors' Meeting was held on March 23, 2018. Consolidated Results for the Third Quarter Ended December 31, 2017. Consolidated Results for the Second Quarter Ended September 30, 2017. Consolidated Results for the First Quarter Ended July 28, 2017. Consolidated Results for the Year ended March 31, 2017. Consolidated Results for the 3rd Quarter Ended December 31, 2016. Consolidated Results for the Second Quarter Ended September 30, 2016. Consolidated Results for the First Quarter Ended June 30, 2016. Consolidated Results for the Year ended March 31, 2016. Consolidated Results for the 3rd Quarter ended December 31, 2015. We filed our Corporate Governance Report with the Tokyo Stock Exchange. Based on it we released our Disclosure Policy (for engaging with capital markets). Presentation including Summary and Q&A Session added. Consolidated Results for the 1st Quarter ended June 30, 2015. Consolidated Results for the Year ended March 31, 2015. Consolidated Results for the 3rd Quarter ended December 31, 2014. Consolidated Results for the First Quarter Ended June 30, 2014. (Additional information) Flash Report ended March,31 2014 [IFRS] added. Consolidated Results for the Year ended March 31, 2014. Consolidated Results for the 3rd Quarter ended December 31, 2013. Consolidated Results for the First Quarter Ended June 30, 2013. Consolidated Results for the Year ended March 31, 2013. Consolidated Results for the 3rd Quarter ended December 31, 2012. Consolidated Results for the First Quarter Ended June 30, 2012. Consolidated Results for the Year ended March 31, 2012. Consolidated Results for the 3rd Quarter ended December 31, 2011. Consolidated Results for the First Quarter Ended June 30, 2011. Consolidated Results for the Year ended March 31, 2011. Consolidated Results for the 3rd Quarter ended December 31, 2010. Consolidated Results for the First Quarter Ended June 30, 2010. Consolidated Results for the Year ended March 31, 2010. Consolidated Results for the 3rd Quarter ended December 31, 2009. Consolidated Results for the First Quarter Ended June 30, 2009. Consolidated Results for the Year ended March 31, 2009. Consolidated Results for the 3rd Quarter ended December 31, 2008. Consolidated Results for the First Quarter Ended June 30, 2008. Consolidated Results for the Year ended March 31, 2008. Consolidated Results for the 3rd Quarter ended December 31, 2007. Consolidated Results for the 1st Quarter ended June 30, 2007. Summary of 3rd Quarter Results Presentation added. Summary of Interim Results Presentation added. Summary of FY06/3 1st Quarter Results Presentation added. Consolidated Results for the 1st Quarter ended June 30, 2006. Summary of FY06/3 Results Presentation added. Consolidated Results for the 1st Quarter ended June 30, 2005. 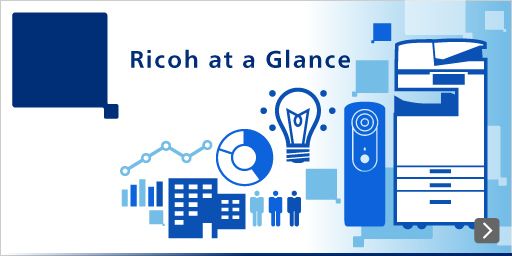 Ricoh Printing Systems is launched to energize the Ricoh Group's high growth printer business. Ricoh and Hitachi signed Agreement on Ricoh's acquisition of Hitachi Printing Solutions, Ltd.
Consolidated Results for the 1st Quarter ended June 30, 2004. Ricoh and Hitachi reach Basic Agreement on Ricoh's Aqcuisition of Hitachi Printing Solutions, Ltd. Historical Datasheet(Excel file:122KB) is updated. Consolidated Results for the 1st Quarter ended June 30, 2003. Financial Indicators added to Financial Data menu. Investors' Meeting was held on March 4, 2003. Movie is also available. Interim Report for the half year ended September 30, 2002. Consolidated Results for the 1st Quarter ended June 30, 2002. Historical Datasheet(Excel file) is added at Financial Data. Investors' Meeting was held on March 19, 2002. Consolidated results for the 3rd Quarter ended December 31, 2001.